Deirdre O’Dare has stopped in to talk about her new ebook, A Mule for a Princess, published by JMS Books! I’ve always had a soft spot for mules. They have been dissed and ignored almost forever and given a reputation they really do not deserve. Like some breeds of dogs which have been given an ugly name, more bad mules come from mishandling than being born evil. When I was in my teens and twenties, I worked with a number of them, and several were as much beloved pets as the horses I had at the same time. It took me awhile but I finally came up with my first mule story, The Mule Man, which came out this past June. No sooner was it done than I began to think about a sequel. I like to revisit some of my characters from earlier stories. Even if I feel like their tale is complete, it’s nice to show them living their HEA! Then inspiration hit. 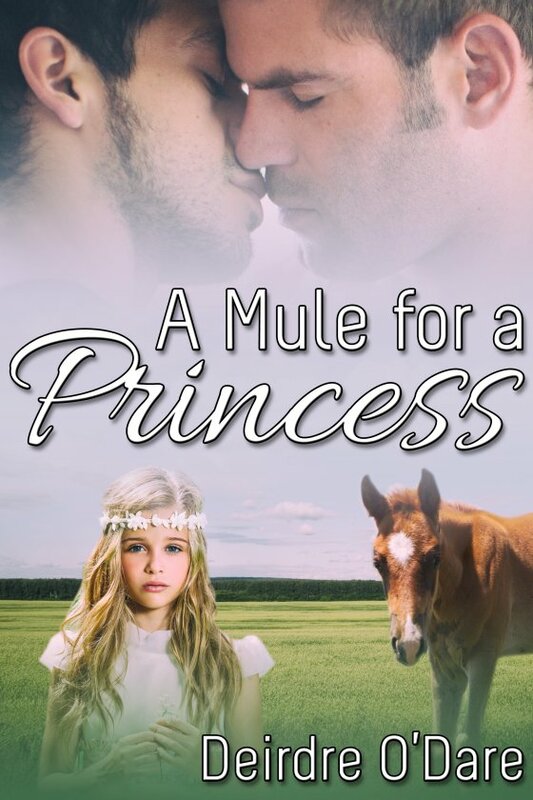 So the title came to me first: A Mule for a Princess. That vague notion was perculating in the back of my mind when young Bobby Estrada limped out of the mists, trudging wearily along the edge of an old two-lane highway. Where was he going and why? He soon told me he was headed for The Mule Man’s ranch, a few more miles along that road. Okay, so where does the princess come in? That was a few months later when a big motor home drove down the unpaved lane to the ranch and some amazing characters emerged. All at once I knew I had a story! It’s half a fairy tale and half based in reality. I ask my readers to suspend belief in a few areas and just enjoy the tale for the fairy tale aspects, a kind of altered Cinderella fantasy. If you read The Mule Man, you will see for yourself that Orr and Jase are together and happy; if you didn’t, this one works a standalone story. At first Bobby is not a totally admirable young man, but he learns and grows during the course of the tale, which should always happen to a main character in good fiction. Eventually he earns and deserves the regard of his princess and that of her dashing guardian, as well. I can’t say more without creating a spoiler, but you now know the rest of the story. You’ll just have to read the book to get the story itself, the one that emerged from all this background! Just to make a point, I’ve included a photo of me with a mule I favored, a blast from the past when I was a working “cowboy girl” on a ranch in central Arizona. Quite a lot of that history sneaks into my writing. It was a unique and sometimes difficult life, but like Bobby, I learned and grew. The mule’s name was Trixie and her mama was an Arabian mare who apparently got hooked up with a jackass! Hasn’t that happened to a few of us, LOL? At least this time it had good results. Trixie was an exceptional little mule as well as being cute as a bug. Like Powwow, she finally went to a good home, too. To learn more about my life and adventures, check out my blogs. For book and writing related posts, go to deirdredares.blogspot.com. To read memoir essays and view more old photos, visit deirdre-fourds.blogspot.com, and to follow my alter ego, Gwynn Morgan, as she researches and develops a nonfiction book about the courageous women who race sled dog teams across the wilds in Alaska and Canada, check out gwynnmorganalaska.blogspot.com. See you down the trail! Hasta luego! Bobby Estrada is tired of school, rules, and boredom. He wants to have adventures. Eventually he arrives in southwestern New Mexico on foot, tired, and hungry. Orr and Jase, the mule men, give him a job mucking corrals. Six months later he has grown up, learned a lot, and bought a young mule to train. That’s when some exotic visitors show up. Doyle O’Brien, an Irish aristocrat, is dedicated to caring for his young niece for whom he became guardian after her parents were killed in a tragic accident. She was also injured. Young Fiona loves horses and rode well before she became partially paralyzed. 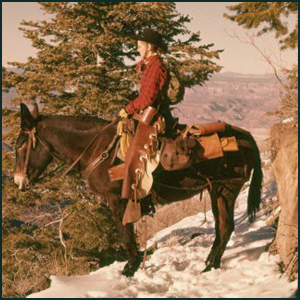 When Doyle hears mules are safe and reliable if properly trained, he decides to try to find a small one Fiona can eventually ride. She immediately falls in love with Powwow, the young mule Bobby has begun to train. In Doyle, Bobby sees his dream prince come to life. In time the O’Briens must go home, taking Powwow. Bobby is determined to go, too. Can an Irish aristocrat and a young Latino cowboy find common ground beyond the lust that sizzles between them and make a modern fairy tale come true? Buy the ebook or read an excerpt!